On Friday, October 16, a mob attacked several churches in Aceh Singkil and burned them down. The mob said that the churches did not have the proper permits to exist. 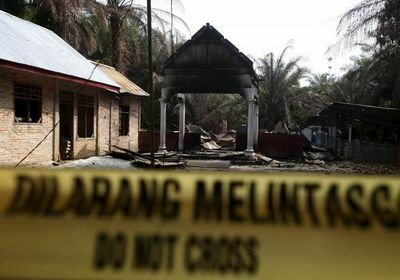 Now, authorities in Aceh are shutting down several churches this week. Authorities have contacted church leaders, and at least 6 churches have agreed to tear down their churches after admitting that they don’t have the proper building permits. They did this because members of the hardline group Islamic Defenders Front demanded that the local government shut down 10 churches because they didn’t have proper permits. After the attack last week, thousands of Christians fled to nearby villages. Some have returned home, but not all. The Indonesian government has deployed 1,300 police and military personnel to the area, with more on standby, to patrol and stand guard outside churches. Pray for these churches to have wisdom as to the next steps to take. Pray that believers would stand strong despite persecution, and that they would be an example of strength and trust to the Muslims around them.